There is a wide variety of system designs. Your system may not be exactly like the drawings. However, the basic principles of operation apply to all systems. 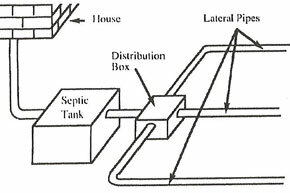 Note that septic systems have two parts: the tank and the drain field (sometimes called a leach bed). The two most common expenditures that result from improper maintenance or operation are frequent pumping and drain field replacement. By frequent pumping we mean more than once every two to three years. This page tells how to prevent both. Septic tanks are designed to allow bacteria and enzymes to biodegrade organic waste. This amazing process actually converts waste into water, carbon dioxide and small amounts of mineral matter! Incoming solid matter sinks. Soap and grease float. The tank has an outlet baffle to hold in undigested waste. Only clean water should leave the tank and enter the lateral pipes. 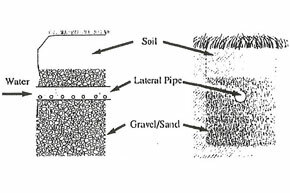 The water flows out of the laterals into a bed of gravel or sand which acts as a final filter before the water enters the ground. 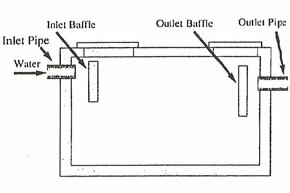 If the outlet baffle deteriorates, undigested waste escapes from the tank. It gradually fills in the spaces between the gravel rocks preventing water from getting into the soil. When this happens water has only one place to go–up! a smelly, soggy, insanitary backyard is the result. When inspecting baffles NEVER enter the tank. If you don’t know how to check baffles yourself, call your professional septic pumper. Unfortunately there are many ways you can inhibit or kill the bacteria and enzymes. This causes waste to build up rapidly resulting in the need to pump the tank once or even twice per year. If you don’t pump it accumulated waste will bypass the outlet baffle and plug the drain field. Your pumper can give you special instructions on how to stop killing the biological action in your tank. Undigested mineral matter builds up on the bottom of your tank over the years. If the level gets too high it can flow out into the drain field. The tank must be pumped before this happens. Pumping every 3-5 years avoids any problems. Check with your state about regulations regarding the frequency of pumping. 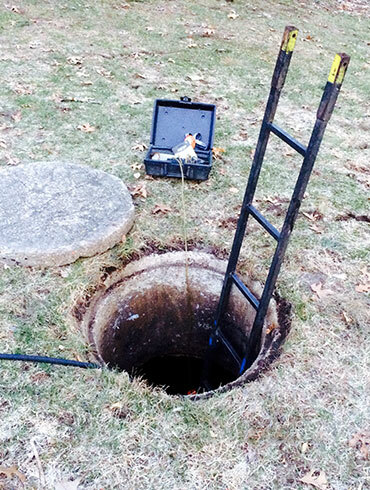 Compared to the high cost of drain field replacement, regular pumping is very inexpensive insurance. Although some bacteria are present in the waste, these organisms do not work well on protein, fiber or grease. Furthermore, modern chemistry has provided us with advanced cleaning products made of complex molecules. Ordinary bacteria just can’t break these chemicals down. Bio-Clean is specially formulated to biodegrade ALL types of biodegradable waste. Bio-Clean contains a larger quantity, a higher quality and a unique combination of ingredients not found in other septic tank products. In fact, Bio-Clean can even restore failing septic fields in some cases. If you follow these four steps, your septic system will give you decades of trouble free service! 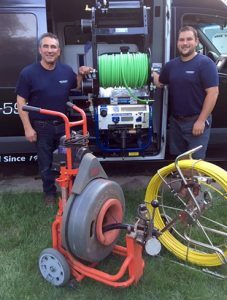 For more information on Bio-Clean contact your professional septic tank pumper.